After three years of being unplayable garbage that would ruin your tempo, thanks to Lakkari Sacrifice, this card is finally good. I remember when this card was unplayable. Now with Silverware Golem and Malchezaar's Imp its not even bad! It's gonna be really good if they will make this card 3/4. Why do they even do cards like this? It's obvious how to make this playable, but not OP: 3/4 or 4/4 body. 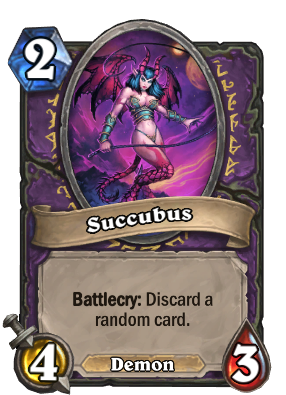 Warlock cards were made intentionally bad, to balance out warlock having the best hero power in the game. And this card is pretty good in arena.